When pictures of Selena Gomez in Ganni’s Roseburg wrap dress during a trip to Capri surfaced, that changed. Legions of ~street style stars~ wear their dresses and they all look the same… bold statement earrings, a spiky sock boot, slicked back hair, and some sort of Staud handbag. But Selena Gomez’s styling? Less trend driven machine whose main goal is to get photographed by Tommy Ton and more relaxed 20-something on holiday whose main goal is to be stylish and comfortable. After seeing Selena in the Roseburg dress, I somewhat believe Ditte. After buying the Roseburg dress, I somewhat believe Ditte. I am 5’5.75” and weigh 111-113 lbs. I normally take an FR 36 in Rouje or Isabel Marant, UK 8 in ALEXACHUNG’s dresses, or a US 2 in Reformation. My Réalisation Par dress size is an XS. My GANNI dress is a Danish size DK 34. A Danish (DK) 34 loosely translates to an FR 36 or a US 2 according to Net-A-Porter’s size chart. If you ever need an accurate international sizing conversion chart, start there. It is accurate. So many brands flounder with their conversions, but Net-A-Porter’s is spot on. The DK 34 Ganni wrap dress is a maxi dress on my 5’5.75” self. The dress comes right down to my ankles, which is perfect: it doesn’t drag. Anyone shorter than 5’5” will need to get it hemmed if they don’t want to trip over it. The sleeve length is similar to Réalisation Par’s Violette in XS. It comes to the end of my wrists and doesn’t overwhelm my arms. You know when you constantly have to push your sleeves up so you don’t get it wet while washing your hands? Ya, you don’t have to do that. Ganni’s Roseburg dress is relatively low maintenance and relatively high quality. You throw it on and instantly look put together… even if you’re in a gas station on a 7 hour road trip. Despite its 100% viscose material, this Ganni dress holds up significantly better than Rouje or Reformation’s viscose. It doesn’t fluff as viscose tends to do, nor are there an abnormal amount of loose threads along the inside seams. 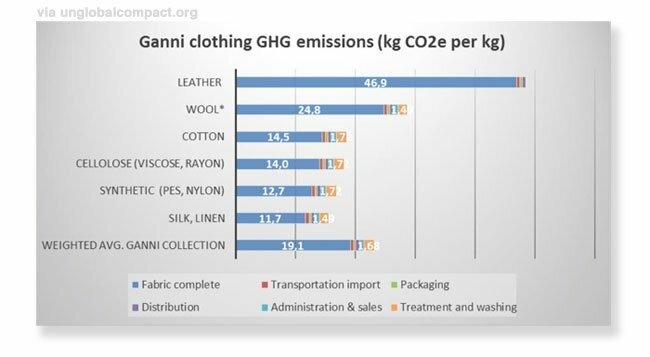 Now to get into a more heavy topic: Ganni’s environmental and social responsibility. GANNI partnered with the United Nation’s Global Compact (UNGC) to do their part in becoming a more responsible clothing brand. All parts of their company are monitored by the UN for being socially and environmentally friendly. … their clothes are still a work in progress. In 2016 they published an analysis of their manufacturer’s carbon footprint and while it’s not great, their recognition is a start. It also lets you decide which fabrics you feel comfortable buying. According to the Global Fashion Agenda (GFA), by 2020, Ganni hopes to become more circular and have their garments be made from 50% recycled textiles — kind of like what Reformation does now. It’s a lot to undertake and it’s easy to mock when line items include “in our daily work at the head office, we strive to use as little paper as possible. ” Their dedication and complete transparency are highly impressive in an industry that’s one of the five biggest polluters. Did you make it through all that? Let me know in the comments what you think of Ganni’s moves to kick out bad practices. –Responsible Company: While some parts of their literature (ahem, turning off lights in the HQ office) sounds like marketing malarky, it is nice to know that this company cares. –Quality: I hate viscose, but have to admit that the viscose Ganni uses is higher quality than other brands’. –Length: This maxi dress length doesn’t look messy or lazy. –Comfortable: Ganni’s Roseburg dress is a “throw on when you feel like wearing sweatpants but can’t stand to wear sweatpants in public” kind of dress. –Sales: … however, sales make you less likely to feel like they’re “forever” type clothes and you might be more prone to get rid of it sooner. –Not Bra Friendly: Most of Ganni’s dresses are bra friendly, however their wraps dip too low to wear one without showing the world. … not necessarily a “con,” but this Ganni dress’ label said to hand wash. Normally when things say hand wash, I throw it in the machine on “delicate” and cold water and everything is fine. My Ganni dress shrunk. It’s still wearable, but going forward, I would either dry clean future purchases or actually hand wash them. When it comes to Ganni, put aside those overly styled street style outfits and consider the garment for what it is. Will it work in your closet longterm? Or is it just another Fashion Week Month peacock piece? This principle will help you be a conscious & responsible shopper more than using “cleaning cloths that are free from microfibers” ever will. In my closet, Ganni’s Roseburg dress works for those schlubby days when I want to throw on a dress, forget about my outfit (while still looking good), and take in the world around me… and I’m sure Selena Gomez would say the same during her Italian vacation. Ganni’s clothing are available from their online store or from a variety of other online retailers. –Size Down From Your French Size: ex. I take a FR 36, but in Ganni, I take a DK 34. –Wait for Sale Season: Ganni clothes go on sale and are stocked on a lot of online retailers. So, unless you need an item ASAP, you might as well wait until it’s 50% off.